Many of us dream of the idyllic “Mediterranean lifestyle”. We imagine relaxed summery days in a quiet town and chatting with friendly neighbours in narrow cobbled streets. Local people and visitors eat Tapas in pretty plazas, bask in the sun during the siesta and go for dips in the sea. Residents, students and tourists alike can be found devouring ice-creams and eating seafood in lively local restaurants. For all of these things and more you can study Spanish with us in Alicante on the Costa Blanca! The year-round mild climate, delicious cuisine and beautiful coastline, consisting of picturesque coves and white sandy beaches, are just a few of the reasons to choose Alicante. Alicante has approximately 330,000 residents and offers the best of city life, in the sense that there is always something to do. You might dress-up for a concert or for the theatre, or to go to a fiesta or a fine restaurant. The combination of this with the relaxed small town friendliness, fine traditions and surrounding history, may just result in you never wanting to leave! 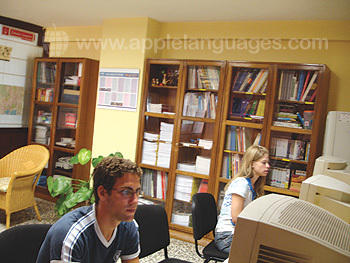 Our school in Alicante has 3 floors and 5 air-conditioned classrooms. 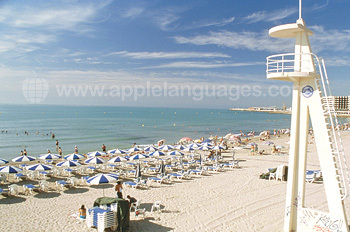 It is located in the centre of the city, just 5 minutes’ walk from the famous beach “Postiguet”. There is a library and a lounge area with free wireless internet access. Our Club 50+ course is designed for all students aged 50 and above who already have some prior knowledge of Spanish and wish to combine excellent language classes with an enjoyable cultural holiday. This special program runs at several levels. It includes 4 general Spanish lessons per day in addition to 4 social activities each week, designed with mature students in mind. There are special start dates for the programme which you can attend for a duration of either 1 or 2 weeks. 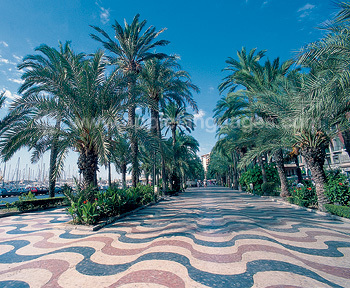 The people of Alicante are known for their warmth and their friendliness. The best way to experience this is to stay with one of our specially selected Spanish host families. Having the chance to share your meals and facilities in the home will bring you closer to the Spanish way of life. It will also give you plenty of opportunity to practise your language skills. Host families can be a married couple or single people, often with grown-up children who are no longer living at home. All hosts are located at walking distance from the school in Alicante. We will be happy to assist with any special dietary requirements or other needs you may have. Please don’t hesitate to contact us for more information. The Club 50+ activity program in Alicante is exclusively designed to cater for the interests of our mature students. It will enable you to discover more about the city and the local area, the history, culture and traditions. We aim for you to be able to practise your Spanish every step of the way! There are guided visits to museums and places of interest around the city, such as to the Castillo de Santa Barbara, as well as gastronomic experiences such as a wine tasting, Tapas tours or dinner in a local restaurant. You may have the chance to see a live Flamenco show or to visit the theatre and thereby immerse yourself in the culture in a relaxed environment, with other students of a similar age. All students attending the Club 50+ programme in Alicante must have prior knowledge of the Spanish language on arrival at the school. The class that you are placed in on the first day of the course will be suitable for your level following a level placement test and class sizes are kept to a maximum of just 9 students. This course is ideal for any mature student who wishes to experience the relaxed Mediterranean way of life and receive excellent Spanish language tuition at the same time. A return airport transfer service from Alicante airport is included in the programme fees, so that you will be met at the airport by a representative from the school and taken directly to your accommodation on your arrival. You will also be dropped off at the airport on the Sunday after your course finishes.